evoluzination: Learning: can Mindset change it all? 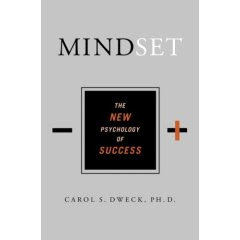 Reading "MindSet" from Carol S. Dweck was an inspiring source of understanding how our minds work specially when it comes to learning. It explained why I went through most of my school years just focused on grades instead of learning itself. I adopted the mainstream belief of my time that was that intelligence was a fixed ability that you either had or not and in whatever amount you had it that was it. Once I got to get the label of "intelligent" my only worry was to keep up with it. When a kid focus is on keeping a label, all that's really important is lost. On the other hand, as the book explains, when you give a kid the opposite belief, that intelligence as any other ability is trainable and is attainable and increasable, they flourish carelessly while they focus on learning and satisfying their own curiosity. Basically, the bottom line of the book is, never tell a kid how smart they are, always praise the effort they made and the results they obtained. In other words, instead of saying: "you're so smart! ", tell them: "look how great you're doing now, after practicing your math today". It's kind of hard to believe that just such a small change in mindset can make such a difference, but in reading the book I realized this is the case. It's been longly known now, that kids love to be presented with challenges. For something to be perceived by kids as a challenge, it has to be leveled to their present skills and just one notch up. If something is too hard, it'll be frustrating. Too easy? boring. It looks like computers will in the long term be able to impart a much better learning experience to kids than a teacher can, as they'll be able to personalize the experience to the exact degree needed in each case.